Robert Edwards will be presenting “Metadata, Meta What?” at the ACMP Huddles (stand 548), 3.00pm Friday 28 April 2006. Come by and visit us. Attendees to the Metadata talk will qualify for discounts on Photo Mechanic and iView MediaPro. 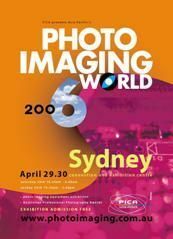 Photo Imaging World is Asia Pacific’s largest, annual photographic trade show. It encompasses equipment exhibitions, conferences and workshops, the Australian Professional Photography Awards, and a gallery showing off the best in Australian photography. The trade show is free and open to all. To avoid the queues you can pre-book online here.